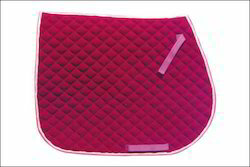 With the active support of our team of experts, we are engaged in offering a huge assortment of Drill Saddle Pad. This premier grade Soft Cotton Saddle Pad is offered with Diamond Quilting, High Density Foam Filling, and PP Binding, matching trim girth loop and billet string. These are offered at market leading prices to gain optimum client satisfaction. We offer the best quality Horse Saddle Pads. Our Horse Saddle Pads protect horse from saddle-associated injuries while riding. Our Horse Saddle Pads are faultless for the show ring or for a peaceful ride on a lonely track. We offer Horse Saddle Pads at very affordable price. We manufacture fine quality horse saddle pads that give best protection to horse’s back. These saddle pads are specially designed to fit the shape of horse back.